Mark Aston has challenged his Sheffield Eagles side to go out on a high, with the director of rugby expected to make changes to his playing squad for next season. 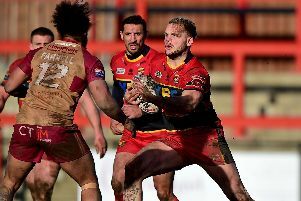 The Eagles have almost completed their survival bid with only an extraordinary set of circumstances capable of stopping their run in the Betfred Championship. Aston has now focused his attention to a strong finish to the campaign before he again begins the process of molding his squad for 2019. The Eagles chief has already stated there will be changes to the playing staff next season, and has set the challenge to his current crop to end their time together on a high. “We have spoken about this for a while now, but in five more games this squad, this group of people, will be disbanded,” Aston reaffirmed. With the Challenge Cup final set for this weekend, the Eagles have another break before the Championship Shield resumes with a Friday night hosting of Dewsbury Rams at the OLP. The fixture is the start four home matches from their last five games, giving the players the opportunity to finish the season strongly on home soil. Aston also has an eye on finishing as high as possible in the Championship standings, with last weekend’s victory taking his side above the Rams and Barrow Raiders in the table. With their off the field situation far from stable, there is not only pride at stake for his troops, but the extra revenue for a higher finish in the table could be vital. “The lads have set some objectives of what they want to achieve,” Aston adds. “There are five games left now, and the lads want to win as many as they can.